Donkeys years ago, I set off on my own to travel round the world for a year. I took three sketchbooks, a tin of watercolours and and a little box of pastels. I started shakily, my hands sweating, [I was standing on a street corner in Bangkok!] I was nervous to be in strange places on my own, and although I was often approached by people, it was a relief to find that it was not me, but the sketching that caused interest and my drawing would be scrutinised and commented upon, with discussions going on about how I’d got the colour of the banana’s wrong and such like. This happened wherever I went and although it was a bit nerve wracking I found a curious sense of safety in the sketchbook. 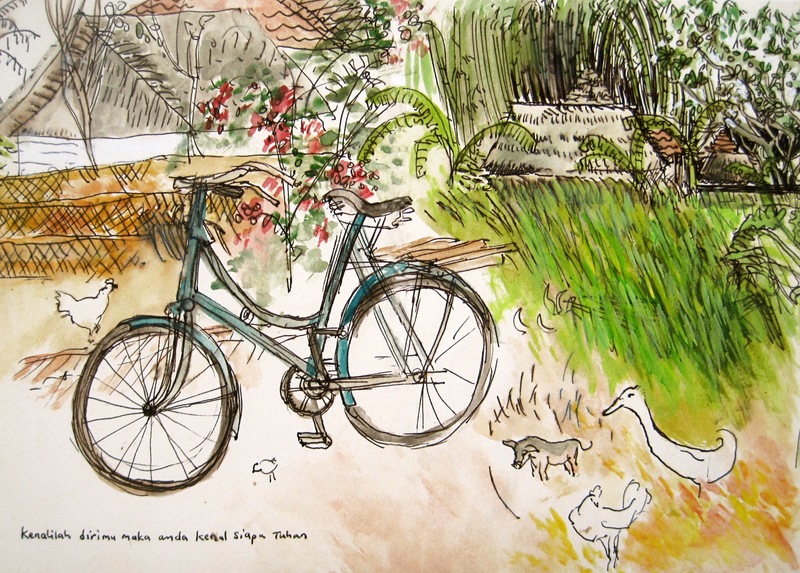 This picture is a drawing I made in Bali, Indonesia, where I hired a bike. The left side of the drawing is what was in front me and the right side of the picture is what was behind me. I am not sure where the little pig was as he is certainly not to scale!